After several years of full time work trying to develop a system for achieving superior investment results, it finally dawned on me to look at the composition of the Forbes 400 richest Americans list. Besides Warren Buffett there we very few others who had been able to develop an approach that beats random luck (Google: marketwatch "lazy portfolios"). The overwhelming source of financial success in America comes from what I call ORGANIZATION EVOLUTION © and early participants who are able to avoid being pushed out. What follows is my contribution to helping others explore the terrain and develop an approach grounded in reality. For interesting articles on financial investing and their connection to events in the real world (other TLN dimensions) see my TLN blog. Also see my del.icio.us financial investing and financial planning tags which contain links to articles introducing portfolios of low effort and good return investments.. Typical investment results. Calendarizing this should result in over $500,000 of additional wealth with very modest assumptions. I highly recommend devoting more time to INFORMED life designing, career evolution, organization evolution. and thinking about the content and design of your life management or navigation system—its adequacy for the challenges ahead. I believe your interests will be best served by acquiring the basic capacity to make informed investment decisons and disregard the perpetual noise and cocktail party BS. 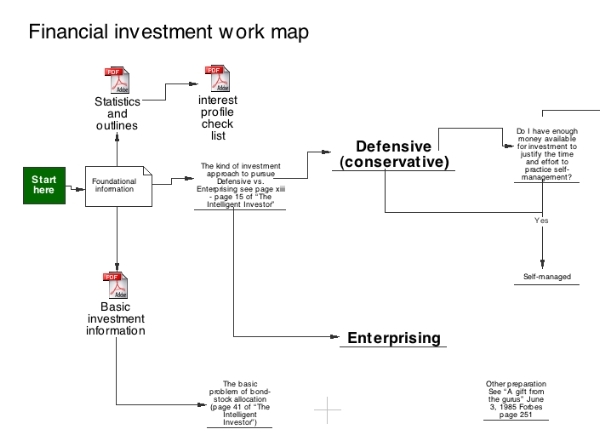 I also highly recommend that you develop a diagram (blueprint) of your financial investment system. This or a similar page can be used to help the younger people in your life. Where else can they get information like this? The work map below can be downloaded by clicking here. The pdf file contains several additional pages that are mentioned in the image "Some basic investment information"
The idea is to use these resources to decide on your approach and then calendarize your work plan. The pdf icon labeled "Basic investment information" refers to the image below. The other two pdf icons refer to the terrain exploration files. 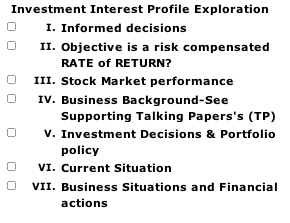 This is the table of contents for the pdf icon labled "Basic investment information." Essentially the intelligent investor should attempt to calendarize the actions necessary to implement the "summary of investment principles." 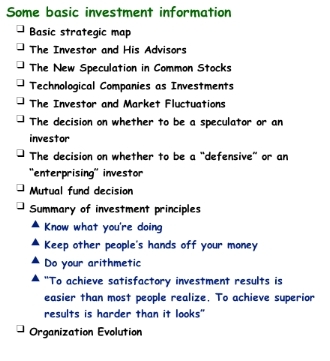 These principles are presented in more detail on page 286 of The Intelligent Investor. The action to implement the third point "Do your arithmetic" is covered in the final page of the work_map.pdf (Stock return calculator). You can also find additional info on this in any good book covering Warren Buffett's valuation approaches. Few people succeed in preserving capital (that is, maintaining the value of their savings in real terms for future, use), and even fewer will succeed in the future. Social trends are against them. There are so many great families whose former grandeur survives only as an echo—in the names of museums, converted mansions, streets, and towns. Their descendants don't have it anymore. Taxes, inflation, expropriation, and changing times have pulled them down. If they, armed with the cleverest advisers, bankers, and lawyers couldn't keep their money, can it be easy? Survival is a competition. What you have, including your savings, others want, and will struggle to get. The push to take it back from you is as relentless as that of the sea to overcome the dikes that contain it or the jungle to enfold a patch of cleared ground. The whole order of nature pushes to reclaim its own. Governments bow to that kind of pressure. Pieces of paper are a weak defense. Only through deep understanding and superior tactics can the investor hope to preserve even part of what he has saved, and the job gets harder every year. In many countries it is virtually impossible, and almost everybody eventually becomes a ward of the state, whose pretensions thus become irresistible. The barons being impoverished, King John is supreme. Property means a degree of economic freedom, without which the other freedoms are eggshell-thin. But think what has happened to familiar forms of investment property in recent years. Bondholders, including government bondholders, pensioners, and insurance beneficiaries have been slaughtered with a smile, what with the depreciation of the currency and taxes on income. The investors, often of modest means, who put their savings into New York rental buildings have been largely wiped out by rent control. The Dow Jones Industrials, adjusted for inflation, are lower than they were sixty years ago, and the long-term holder of U.S. Steel or General Motors has lost nine-tenths of his former buying power. In preserving capital the right attitude is indispensable. You must be passive in deciding to buy, but aggressive in searching out the values and in digging all the way down to the rock of reality: the yin and yang of the job. In buying, Talleyrand's Surtout pas trop de zèle is even more important than in statecraft. It usually pays to wait patiently for the rare bargain in first-class assets, rather than keep swinging for the fences with a succession of exciting speculations. Enthusiastic hyperactivity is in fact the hallmark of the losing investor. The world is not transformed from one day to the next, and the average investor makes less money with his brain than what in chess is called his Sitzfleisch, or patient rear end. The safe time to invest is when people are discouraged or desperate, and the safe thing to buy is what isn't wanted. The dangerous time to invest is when the market is all atwitter like a tree full of birds, and when it's standing room only at the brokers'. The dangerous purchase is what the crowd is queuing up to buy regardless of price, having been told that "Truly first-class works of art (or IBM, or land, or diamonds) can only go up." Remember those words. They are the early warning signal of much lower prices. The active side of investing—ferreting out the values—is no easy matter for the layman, but he can get it done for him by a professional at a reasonable price if he knows what he wants. This book, then, is intended to tell the investor what he should be looking for, where to find it, and how to test what he gets in order to make sure it is authentic. In recent times four new challenges to invested savings have become of cardinal importance: taxes, inflation, union labor monopolies, and disguised expropriation. Taxes have skyrocketed in this century, and now take a huge proportion of all one's earnings. Suppose you earn a salary, pay tax on it, and after living costs have something left over to save. If you put those savings into a common stock, the company whose stock you buy pays a corporate tax of about 50 percent, and then your dividend is taxed all over again by federal, state, and municipal authorities. You will have left to spend only one-quarter or so of what has gone in taxes, or one-eighth if you include the tax you paid on your original salary. [In periods of rapid inflation the tax bite is even worse than this, since the permissible depreciation is inadequate to finance plant and inventory replacement. Thus, corporate taxes for many companies take 70 percent of true earnings, not 50 percent.] And capital gains taxes and estate taxes come on top of that! Clearly, a cardinal point of anyone's investment policy has to be to keep down the tax bite. This means that for an individual any investment approach that depends on taxable income or on trading is much less efficient than one that doesn't. A widow will often work herself into the "income illusion" pickle. She has $800,000 and needs $60,000 after tax to live on. So she invests in bonds and utility stocks for "income," pays the tax, and lives on what's left over. But her principal is shrinking in real terms by the amount of inflation—10 percent a year, let's say. After fifteen years she's a pauper. Differently put, after twenty years of 10 percent inflation you need five times your previous income after tax to stay even! Inflation, of course, puts you into higher and higher tax brackets even though your real income doesn't change: "bracket creep." In addition, it increases not only your own living costs but also the costs of whatever companies you own stock in. Inflation is one of the most extraordinary phenomena of our times, one whose causes might be described as bafflingly simple. I believe it reflects the moral soundness and realism of a society. Eventually prices are determined by how much demand is bidding up how much supply, and if people's demands increase faster than their output (discussed later as the "grasshopper syndrome" and also called the revolution of rising expectations), you will have inflation. Inflation seems to be part of the price of democratic government. [Professor C. Northcote Parkinson once proposed to me the sinister formula: Democracy Equals Inflation.] It always seems politically easier to give way to inflationary wage and welfare demands and then rescue the economy by deficit spending, meaning more inflation. Also, of course, in the lifetimes of many of its present inhabitants, the world's population will have tripled, from 2 billion to 6 billion. Since a child only pays its own way after many years, a country is always borrowing to finance infrastructure, an inflationary process. Any kind of monopoly puts prices up, and the creation of a union labor monopoly armed with the strike weapon not only fuels inflation but also undermines the claims of capital. I am all for unions—to which, indeed, I have spent quite a lot of time as a financial consultant—but everything has its limits. Anyway, the investor must face the fact that if an enterprise enjoys only moderate sales growth and the workers are in a position to demand rapid pay advances, then the owners won't do well. That describes most companies these days. Disguised (or overt) expropriation happens constantly abroad, and often enough here. Price controls, including rent control, are a form of expropriation, as are many other kinds of regulation, along with confiscatory taxes. If debasement of the currency strips away the benefits of your pension or your life insurance policy, is that not a form of expropriation? To sum up, for a substantial investor only a program that explicitly takes account of taxes, inflation, labor pressure, and quasi-expropriation is realistic. That rules out most of the stocks and indeed investment strategies that used to be attractive. Still, don't despair. There are solutions. This book takes the reader through many of the subjects I discuss with new clients, in much the same way I like to present them. Investing is an interesting but complicated subject, full of surprises. You need to understand how the whole thing really works in order to achieve good results, whether on your own or with whatever professional you engage to help you. When Von Frisch studied how a honeybee tells his mates the location of a treasure of blossoms, he discovered that the news is transmitted through a dance. The returning Columbus lines himself up at an angle in the hive corresponding to the angle that the path to his discovery bears to the sun, and goes into his honey dance. If he has made a rich find, he does a particularly agitated dance; if the find is minor, he dances more sedately. Depending on the activity of the dancer, more or fewer bees join in. Thus the right number are mobilized and briefed to zoom out from the hive on the "beeline." If the dancer's navigation is faulty, they all tear off in the wrong direction. Most animals that live in groups transmit emotion to the rest of the group through signals: greed (as in this case) or alarm or indeed panic. Part of the herd instinct must be a deep compulsion to do what these signals say. My part of the country is graced by numbers of white-tailed deer, which I like to creep up on and observe. When the sentinel finally picks me up, though, and snorts and throws up his tail, even the tiniest fawn bursts into flight. I doubt he could hold himself back however much he wanted to. The stock market is an index of how investors feel about the future, not the present. In other words, it is a barometer, not a thermometer. In a ship, the worse the storm and the sicker the passengers, the sooner things will improve and the barometer start rising. (The greatest rise in stock market history was in 1932, in the midst of a financial hurricane, when the Dow Jones Average doubled in less than three months.) Similarly, once the weather is perfect, the next change in the barometer will probably be down. The market rolls along in an endless series of psychological cycles, which are easy enough to understand—although measuring them is not so easy. The ebb and flow of mass emotion is fairly regular: panic being followed by relief, and relief by optimism; then enthusiasm, then euphoria; sliding off again into concern, desperation, and finally a new panic. In human affairs excesses provoke corrections, and the momentum of the correction carries on to provoke a new and different excess. So it is with politics, so with religion, so with art, and so with tides of opinion generally, including the stock market. The typical emotional cycle is roughly four years from peak to peak or valley to valley, although there are plenty of exceptions. The easiest way to measure it is probably not just stock prices, since higher company earnings may hold the market up even though the emotional cycle is fading; rather, one should probably measure it by the rise and fall of price-earnings ratios. If one plots them quarter by quarter, the result is usually a parabola: turning up steeply, flattening, rolling over, and then falling faster and faster.